Fri., March 3, 2017, 12:43 a.m.
LAS VEGAS – It’s home now – familiar, comfortable, lived-in. Like home, the bedroom has the odor and sometimes the eye-watering haze from Dad’s Marlboros – even though he gave up smoking years ago. Like home, you’ve been in it long enough and seen enough warts that it has you eyeballing newer digs or a bigger space, though at the moment you really can’t afford it. This is where the West Coast Conference lives in March: the Orleans Arena. The 2017 league tournament will be the ninth at the pavilion attached to the Orleans Hotel & Casino off Tropicana Avenue, with at least two more events to come after the WCC tacked three years onto the contract in 2016. But how the league got there is a tale worth retelling. Because it was mostly by accident. And, to little surprise, a healthy nudge from Gonzaga was required. First some history: It wasn’t until the 1987 season that the timid, pennywise WCC finally dipped its toe into the postseason tournament business. Only the Big Ten and Ivy League held out longer – the Ivies just getting into the act this year. For that first tournament, opening-round games were held at campus sites – Gonzaga was upset at home by Pepperdine after being the WCC runner-up – and the four survivors gathered at the University of San Francisco to play it off. Minus the Dons, who had also lost. After that, the league members grasped the need to take all the teams to a common venue. But mindful of their limited audience then – and a presidential mandate to not lose money – they settled on an iPod shuffle rotation of campus gyms capable of playing host, usually in the Bay Area to save on travel expenses. San Diego became the new favorite when it built the Jenny Craig Pavilion. The league took it to Gonzaga once, begrudgingly, in 2006, after the McCarthey Athletic Center was finished. By that time, however, Gonzaga had long been agitating to go to a neutral site, in the interest of fairness – and to protect regular-season champs often forced to play lower seeds on their home floor. Former coach Dan Monson raised some ire in 1999 by calling the tournament “the Santa Clara Invitational.” Successor Mark Few picked up the drumbeat, and in 2002 triggered a notorious episode in which former WCC commissioner Mike Gilleran called a testy press conference to rebut Few’s criticism – while a semifinal game was being played. Still, the Zags hammered the hosts by 25, the kind of thing which tended to muffle any urgency to find a neutral site. But lower-seeded hosts were 9-13 over the years, compared to lower seeds going 28-75 in other games. WCC athletic directors had toured a few prospective sites. The seedy San Diego Sports Arena was one (”I thought it was great just because it wasn’t somebody’s home floor,” Roth said). Bakersfield wanted the WCC, but the league didn’t want it back. A Portland marketing firm helping the league tossed out the idea of converting a tennis stadium in Indian Wells for basketball – ignoring that the games would then have to be played outside. On Saturday of Thanksgiving weekend 2006, Roth idly switched on his TV to watch some basketball and found Kansas playing Florida. Good game – Kansas would win 82-80 in overtime over the eventual national champs – but what riveted Roth was the announcers’ description of the venue: a Las Vegas hotel property, 7,500 seats, not inside the casino. But mostly he recognized this: destination location. The following Monday, he rang up Kansas associate athletic director Larry Keating – whose son, Kerry, was in his first season as Santa Clara’s head coach. After getting a rave report, Roth then sicced his facilities director at the time, Joel Morgan, to do his own research on specs and availability. And then they booked the building – Morgan thinking ahead to do it for two years, 2009 and 2010. The 3-year-old arena wasn’t awash in events or tenants at the time, and GU didn’t so much as have to put down a deposit. Roth did have to do some selling, however. After all, this was the church league – faith-based institutions all. Even after finding an affordable, neutral site in a destination city, a few of the principals saw the destination as Gomorrah. To what, they asked, are we exposing our impressionable student-athletes? And all the schools – even the California members – were giving their fans a reason to travel other than just basketball. That first year, tournament attendance was 31,380 – a 54 percent increase over the best previous figure. Average per-session sales have dipped to less than 7,000 just once. Even with all teams traveling, it’s always made money. Of course, the reason it succeeds is Gonzaga. Bulldogs fans travel like mad, and many are faces you never see at McCarthey Athletic Center. This is their entrée to games they can’t get into in January and February – and the success of the women’s team has only added to demand. BYU’s entrance into the league has helped, too. Saint Mary’s, for all its success, is just an OK draw. The rest of the schools can only aspire to indifference. Now there are more options in Las Vegas. The Pac-12 followed the WCC’s lead and came to town, but holed up in the MGM Grand Garden Arena on the Strip. The new T-Mobile Arena, soon to be home of the NHL’s Las Vegas Golden Knights, is a hefty 18,000 seats for basketball. Even so, the WCC recently sent out a marketing survey that included a question about the tournament site – listing options like Sacramento, San Diego, the Bay Area and Portland. 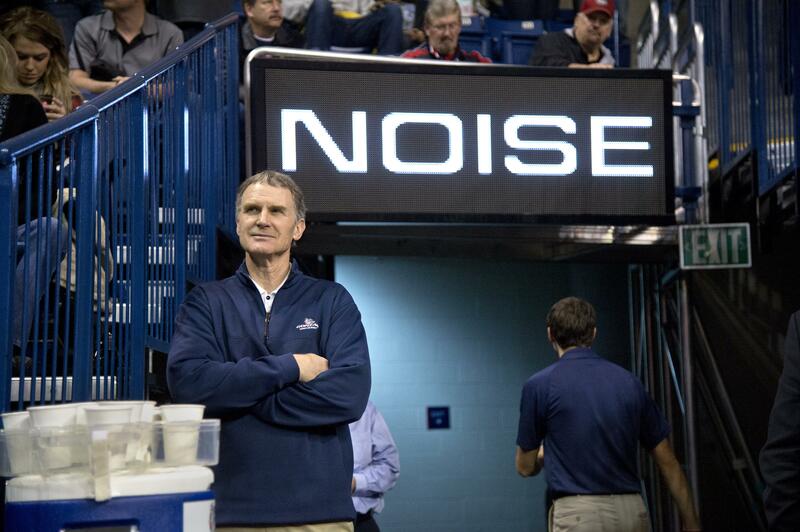 Like when the WCC was going around in circles – until Mike Roth turned on his TV that Thanksgiving. Published: March 3, 2017, 12:43 a.m.